The PGU 20V-2A is the greater brother of the PGU 10V-1A. It has twice the modulation voltage and twice the current. The lowest range amounts to 100µA that is equivalent to a resolution of 10nA=1mV. The PGU 20V-2A-E is in the performance data equal to the PGU 20V-2A. Nevertheless it has two more measurement ranges with the result that the lowest range amounts to 1µA that is equivalent to a resolution of 100pA=1mV. 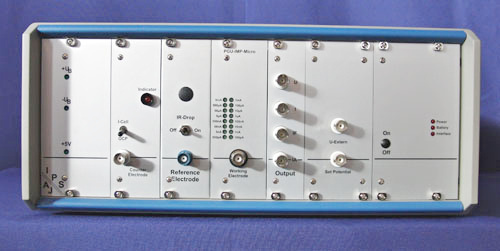 The PGU 10V-1A is a cheap laboratory device. 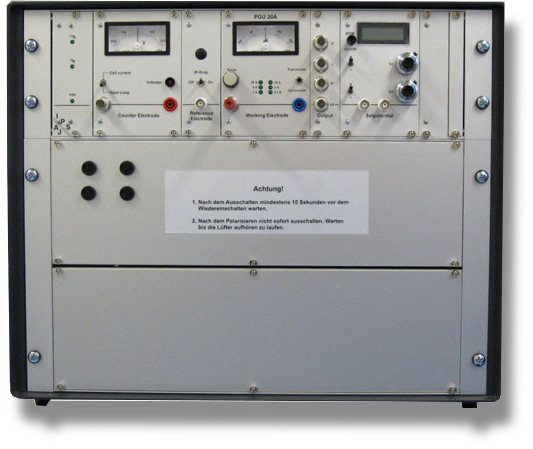 As solid constructed potentiostat / galvanostat it performs a variety of standard experiments. The modulation voltage amounts to approximately ±13V, the polarization voltage ±3V with the integrated nominal voltage generators and ±10V with interface. The maximum measureable current amounts to 1000mA, the lowest current range is 10µA that is equivalent to a resolution of 1nA=1mV. The device can be manually used by the integrated instruments, the inputs and outputs can be connected to external measuring instruments or an interface is integated. With interface and our software EcmWin the most common standard methods like OCP measurement, hold experiment, scan, cycle and pulse are available. The PGU 10V-1A-E is basically like the PGU 10V-1A. Nevertheless it has two more measurement ranges with the result that the lowest range amounts to 100nA that is equivalent to a resolution of 10pA=1mV. The PGU 100-PCR is our potentiostat / galvanostat for standard measurements and for the measurement of the electrochemical noise. The basic construction is equivalent to the PGU 10V-100mA. Two more modules on the right side of the device extend the features for the measurement of the electrochemical potential and current noise. These modules provide several special features like AC-interlinking, switchable filter frequencies and amplification. Meanwhile we have also equipped other devices of the PGU-series with these noise modules with the result that the measurement of the electrochemical noise is not limited anymore to this type of device. 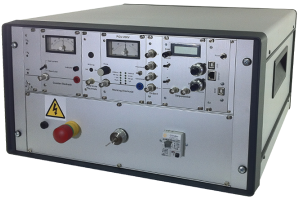 The PGU 10V-10A is a high current device for speration experiments or battery research. The construction is equal to the standard PGU devices. It is completely manual operable. Equipped with interface all standard methods are available. 8 current ranges provide also a sensible resolution of lower currents. As 20V device a higher output voltage is available. Optionally the polarization voltage can be raised accordingly. This can be necessary for example when poor conducting electrolytes are used. But it is also necessary when 12V batteries are tested at a higher modulation current as well as a higher polarization current. The PGU 30V-20A is a little powerpackage. The design and the ease of use is like all PGU standard devices. The special feature is inside. With a modulation current of ±35V, a polarization voltage of ±30V and a maximum current of 20A (at 30V) here is a considerably power available. 6 current ranges provide enough resolution for the lower mA-range. The PGU 100V-2A is our new 100V standard device. With an output voltage of ±140V, a polarization voltage of ±100V and 8 current ranges from 2000mA to 1µA numerous experiments that require higher voltages can be performed. The PGU 100V-10A is the big brother of our 100V standard device. Particularly for galvanic experiments or for anodization both high voltages and high currents are needed. Due to the high performance of this device it is equipped with a programmable power supply. Thereby, no excessive power dissipation must be dissipated as heat. However, this means a limitation of the control rate / speed. 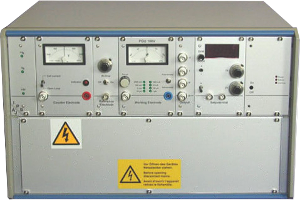 This device is not suitable for pulse experiments with rise times in the ms range. The PGU 200 V is a high voltage potentiostat/galvanostat. 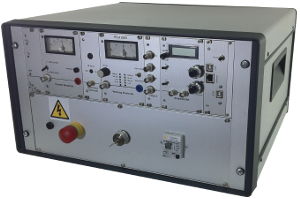 For applications, where the customer needs a higher compliance voltage we designed the PGU 200 V with a compliance voltage of ±220 V and a polarisation voltage of ±200 V. The maximum current range is 2 A. 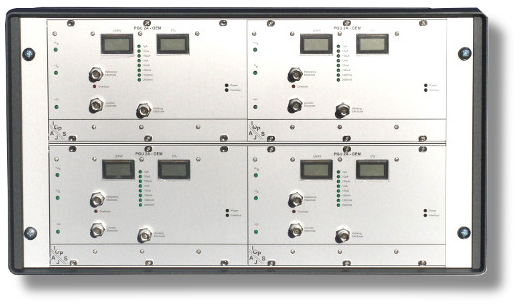 The PGU 400 V is a high voltage potentiostat/galvanostat. 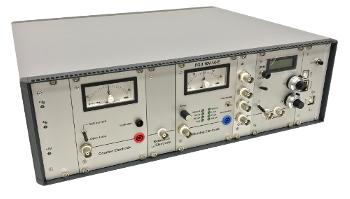 For applications, where the customer needs a higher compliance voltage than 200 V we designed the PGU 400 V with a compliance voltage of ±420 V and a polarisation voltage of ±400 V. The maximum current range is 1 A. This potentiostat / galvanostat can be used for standard and impedance measurements. 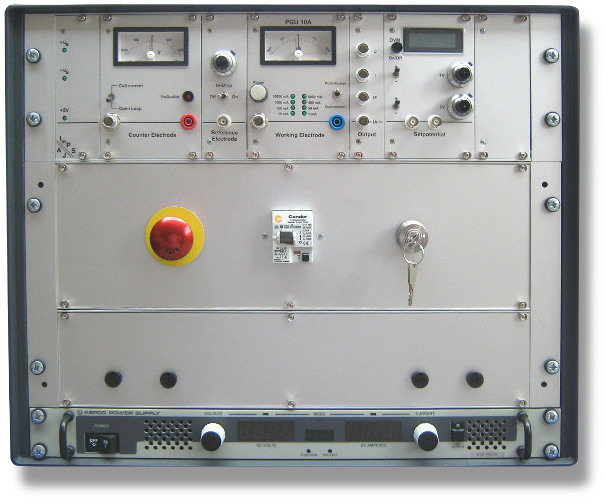 This device has a signal generator for frequencies from 100µH up to 100kHz. A fast measuring module inside allows frequency measurement up to 100kHz as well. The integrated offset adjustment for current and voltage allows efficient amplification of lowest signals down to the lowest frequency range. Due to a specifically approximation procedure very low current signals can be reliable measured at lower fA-range with the result that impedances up to 200GOhms (where applicable even higher) are measurable. Furthermore all available standard methods in our software can be performed with the result that this device is universal. 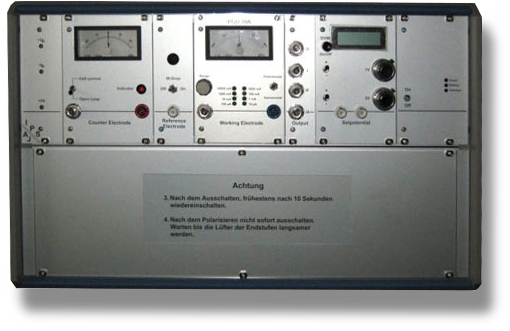 The retrieved values of the impedance measurement are provided with frequency, real and imaginary part. To analyze the data we recommend Solatrons® software ZView™. BI-potentiostat for measurements on rotating ring-disc electrodes. Recently requested out of the fields sensor and medical technology. Output voltage max. ±11V and current of max. ±1000mA. It has 11 current ranges from 1000mA to 100pA with a resolution of 10fA=1mV at the lowest range. Current and voltage displays, two internal nominal voltage generators und two nominal voltage inputs. Integrated interface. 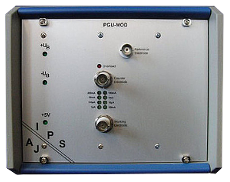 With this device IPS reacts on increased demand of the market for BI-potentiostats that can reliable measure currents from the lower pA-ranges. of 100nA to 200mA or 100mA to 10nA, most applications are processed. Interface and our software EcmWin are included in the product contents. When multiple channel devices are connected to a computer, EcmWIn is started several times, so that each module can be operated separately and with full range of functions. 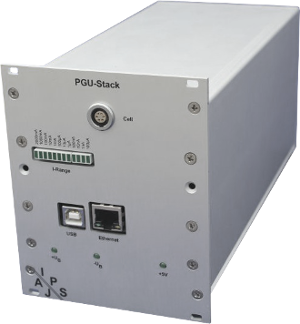 The PGU-stack is more compact, smaller and stackable. Single or four devices in a standard 19" table unit with three rack units. Or 8 devices at 6 RUs or correspondingly more. Connection to the computer via ethernet, equipped with our new interface with 24-bit A/D converters and 26-bit D/A converter (330 nV increment of the scanner). Parallel operation with multiple start of our EcmWin software feasible. In principle arbitrary, limited only by the capacity of the connected computer system. More details in the appropriate datasheet or get in touch with us. The PGU-1A-OEM is a more powerful model of the PGU-MOD-series. 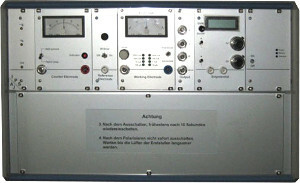 With a maximum current of ±1A measurement tasks that require a higher current can be processed. It is built in a 42HP case, compared to the 100/200mA variant with its 28HP case. If additional potentiostats shall be accommodated in the same housing, we use a twice as high (6U) standard 84HP wide table top case. The following picture shows the 2A version. Especially at request of a customer, we equipped the 2A model with additional displays for potential and current. The devices are used for long term measurement and even with the monitor of the computer in sleep mode, the potential and current can be read off quickly. This instrument equipped version approved well in practice, so we will maintain it. The P-M 100 is a purely manually operated potentiostat. It is mainly dimensioned for hold experiments. The purpose is for example to analyze the cathodic disponding. According to requirements the device can be assembled with only one but also with up to	4 modules. The modulation current amounts to approximately ±12V, the current can be displayed with two ranges with 20mA and 100mA, the maximum current amounts to approximately 180mA. The device has digital instruments for current and voltage. An internal nominal voltage generator amounts to ±2V. No in- and output computer connections. 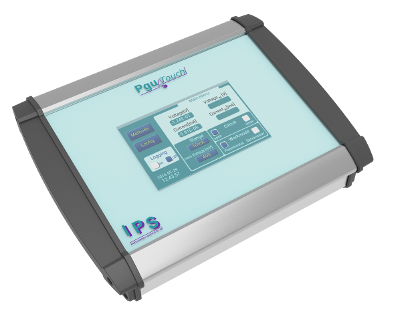 The PguTouch is our latest Potentiostat/Galvanostat in a completely new design. A modern touch display substitutes the previous instruments and manual control elements. The core of the device is a powerful yet low-power ARM-Cortex microcontroller, the ideal prerequisite for portable battery operation. A 4-channel 24-bit analog-to-digital converter for data acquisition and a scanner with a 26-bit digital-to-analog converter give the device the characteristics of a high-quality laboratory instrument. The built-in SD card with 2 GB memory allows the storage of a considerable amount of data. The Ethernet interface is used to read out the stored data as well as for convenient operation of the device on a PC with our EcmWin software. 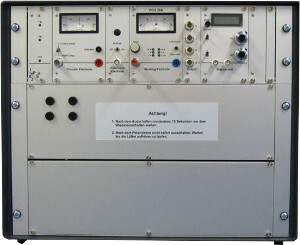 This potentiostat/galvanostat can be used as a laboratory measuring station for more complex tasks as well as a field device for predefined measurement routines. By using a portable computer, more complex methods can be performed in the field.